Foreign Secretary William Hague said that Colonel Qadhafi must hand over power without delay to a government which recognises the aspirations of the Libyan people. “Members on all sides of the House will be concerned by the violence in Libya. The Qadhafi regime is launching military counter-attacks against opposition forces. There has been intense fighting in the East and centre of the country along the coastal strip between the opposition-held Ras Lanuf and the Qadhafi stronghold of Sirte. There are credible reports of the use of helicopter gunships against civilians by government forces, and unconfirmed reports of a helicopter and jet shot down over Ras Lanuf. There have also been serious attacks against the cities of Zawiyah and Misurata in the West, by soldiers backed up by anti-aircraft guns and by tanks. Many of those taken to the city’s hospital have wounds to the head, neck and chest, including a young boy of ten, and supplies of food, fuel and medicines have been all but cut off. In Tripoli, there have been disturbing reports of hostage taking and large military deployments around the city designed to consolidate Qadhafi’s position and intimidate his opponents. His forces remain in control of Tripoli, Sebha and Sirte; but his authority is contested in large swathes of the country where local tribes have withdrawn their support. There is a clear risk of protracted conflict and an extremely dangerous and volatile situation in large parts of the country. Mr Speaker, our position is that Colonel Qadhafi must put an immediate stop to the use of armed force against civilians and hand over power without delay, to a government which recognises the aspirations of the Libyan people and is more representative and accountable. On 5 March opposition groups in the East formed an Interim National Council based in Benghazi. Ministers and FCO officials are in contact with members of this Council, who welcomed the idea of a British diplomatic mission to Libya. This engagement is vitally important to gain a better understanding of the political, military and humanitarian situation on the ground. Last week I authorised the despatch of a small British diplomatic team to Eastern Libya, in uncertain circumstances which we judged required their protection, to build on these initial contacts and to assess the scope for closer diplomatic dialogue. I pay tribute to that team. They were withdrawn yesterday after a serious misunderstanding about their role leading to their temporary detention. This situation was resolved and they were able to meet Council President Mr Abdul-Jalil. However it was clearly better for this team to be withdrawn. We intend to send further diplomats to Eastern Libya in due course. The safety of British nationals in Libya remains an important priority. Since the Prime Minister’s statement the UK military have undertaken a further two evacuation operations from the Port of Benghazi, with HMS Cumberland and HMS York both evacuating British nationals and foreign citizens. In total, we have evacuated more than 600 British nationals from Libya as well as nationals from many other countries. I hope the House will join me in paying tribute to all those involved. We are aware of 180 British nationals still in Libya, some of whom, including some journalists, have told us that they currently intend to stay. We continue to provide assistance and information to help those who wish to leave. We are also working with other countries to isolate the regime and to ensure that anyone responsible for abuses or contemplating further crimes knows that there will be a day of reckoning. On Thursday, the Chief Prosecutor of the International Criminal Court announced his investigation into alleged crimes in Libya, following referral by the UN Security Council. We welcome this swift action and will do all we can to assist. We also welcome the important decision by the UN General Assembly, following referral by the UN Human Rights Council, to suspend Libya’s membership of the Council. European Union sanctions on Libya also came into full force last Thursday. This was the quickest ever delivery of an EU sanctions package, and goes beyond the sanctions imposed by the UN. It includes an arms embargo on Libya and an assets freeze and visa ban on Qadhafi and 25 of his associates; strong foundations on which we can build. As my Right Hon Friend the Prime Minister stated we are making contingency plans for all eventualities in Libya. NATO has been tasked to work on a range of options, including the possible establishment of a No-Fly Zone, the evacuation of civilians, international humanitarian assistance and support to the international arms embargo against Libya. There will be further NATO meetings this week. At the UN Security Council, we are working closely with partners on a contingency basis on elements of a resolution on a No-Fly Zone, making clear the need for regional support, a clear trigger for such a resolution and an appropriate legal basis. My Right Honourable Friend, the International Development Secretary, visited Tunisia on Friday to assess the humanitarian situation. The UK has flown in blankets for 38,000 people, tents for over 10,000 people, and flights to repatriate more than 6,000 stranded Egyptians and over 500 Bangladeshis. This remains primarily a logistical emergency. However it is essential that international agencies are provided with unfettered access to help prevent a humanitarian crisis from developing. With our support the UN’s Emergency Coordinator, Baroness Amos convened a special meeting in Geneva today to call for unfettered humanitarian access inside Libya. HMS York has also delivered 1.3 tonnes of Swedish medical supplies to Benghazi. 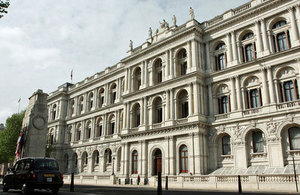 The Prime Minister will attend an emergency meeting of the European Council on 11 March. We will use the Council to press not only for further action in response to the situation in Libya. And, as the Deputy Prime Minister made clear in Brussels last week, we will also urge the EU to change radically its thinking about its neighbourhood. It is time, as I agreed with the French Foreign Minister in Paris on Thursday, for European nations to be bold and ambitious and to show that while Europe will not seek to dictate how these countries should run their affairs, we will always be the lasting friend of those who put in place the building blocks of strong civil societies, economic openness and political freedom. We must give every incentive to countries in the region to make decisions that bring freedom and prosperity. At the Council meeting the Prime Minister will call for Europe to set out a programme to bring down trade barriers, to set clearer conditions for the help it provides, and to marshal its resources to act as a magnet for positive change in the region. The G8 Foreign Ministers meeting will take place in Paris next week. This will be a further opportunity to widen the international coalition addressing the crisis in Libya; to underline with the US, Russia and others the urgency of progress on the Middle East Peace Process and on Iran’s nuclear programme; and to reaffirm our collective support for political transition in Egypt and Tunisia, and democratic reform in the wider region. There has been welcome progress towards democratic transition in Egypt and Tunisia and further progress, including the announcement of a national referendum on constitutional reform in Egypt and of a date for elections in Tunisia. However the resignations of the Prime Ministers of both governments show that significant challenges still remain. However there continues to be instability in other countries, including in Yemen. We have changed our travel advice to advise against all travel to the whole of the country and recommend that British nationals without a pressing need to remain leave using commercial means. We look for governments across the region to respect human rights, including the right to peaceful protest, to avoid the use of force and to respond to legitimate aspirations for greater political openness and economic reform. It remains more vital than ever that we press for a just and lasting resolution to the Israeli-Palestinian conflict. We want to see an urgent return to negotiations, based on clear parameters including 1967 borders. We will work with all the parties to press for a decisive breakthrough this year. President Abbas is visiting the UK this week. I will discuss these issues with him tomorrow, when I will also confirm that given the extent of our aid to the Palestinian Authority and our work with them, we will join many other countries in upgrading the status of the Palestinian Delegation to London to the level of a Mission. Mr Speaker, if change and development can be achieved peacefully in the Middle East it will be the greatest advance in world affairs since Central and Eastern Europe changed so dramatically twenty years ago and many of their countries entered the European Union. If not, it could mark the start of even greater instability emanating from the region. It is vital for both the people of these countries and the rest of the world that the international community plays a coherent and ambitious role in supporting their aspirations. The British Government is deeply committed to this endeavour and I commend this statement to the House.